Great looking 11 inch diameter illuminated globe. Innovative ?dual image inch cartography shows the world politically with the lights off, and adds physical features with the lights on. Includes a booklet hidden in the base drawer that locates over 5000 cities, mountains, countries, islands, rivers and more through an easy-to-use grid system. Two toned silver metal base and meridian. 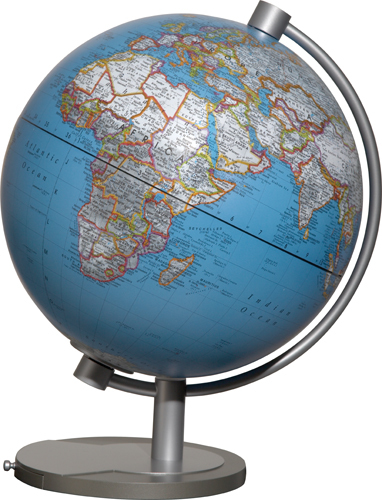 Stands 16-inches tall.ing 11 inch diameter illuminated globe. Innovative ?dual image inch cartography shows the world politically with the lights off, and adds physical features with the lights on. Includes a booklet hidden in the base drawer that locates over 5000 cities, mountains, countries, islands, rivers and more through an easy-to-use grid system. Two toned silver metal base and meridian. Stands 16-inches tall.